"In A Sweet Pea Dream"
Welcome to the final post! Great NEW GIVEAWAY At Once Upon A .... Sketch!!! Naomi Elliott - My HAPPY Place! My latest obsession is Colour Challenges. I have become addicted to them. 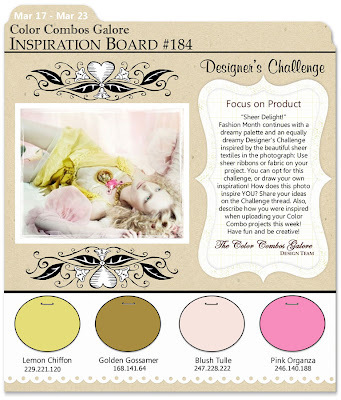 Over at Color Combos Galore there is a new colour challenge each week. 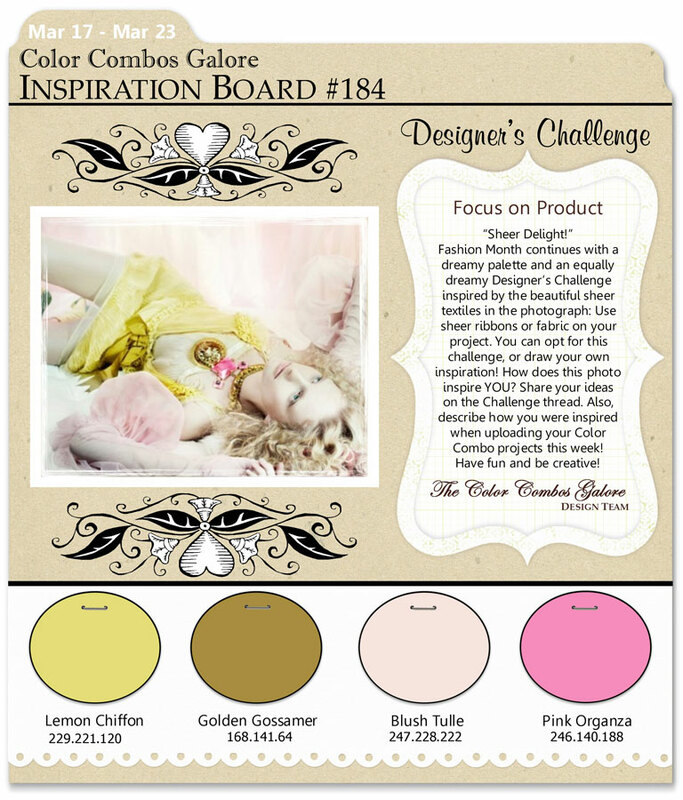 This week is #184 and I just loved the colours. As soon as I saw this colour combo I just knew what photos I wanted to use. I just adore these photos of my gorgeous daughter Mackenzie at 4 months, however they were closer to the bottom of my massive pile of photos so they were just kind of forgotten about. Not when I saw the colours though. I had to dig around for a while to find them but I finally did. I have used a mix of handmade & bought flowers on this LO. I am just loving Prima flowers at the moment and I am steadily building my collection of them........... this LO includes a couple of primas. I also love the ribbon that I have used on this LO, it has little rose buds on it. Welcome to my blog and thanks for visiting. I am fortunate to live in beautiful North Queensland, Australia. I am a stay at home mum (for now) to my 2 gorgeous children, Jayden (7) and Mackenzie (3). I love everything to do with being creative but my latest obsession is Scrapbooking........ this is my journey in the fantastic world of the creative. I hope you enjoy my blog and find some inspiration whilst you are here. All photographs and design work are copyright. All rights are reserved to Samantha Bailey. All designs are shared for personal inspiration and enjoyment only. No design is to be copied for the purpose of publication or contest submission. If you do find my designs inspiring enough to use them, please give credit where it is due. Please use my designs for inspiration only and do not directly copy them. Thank you.